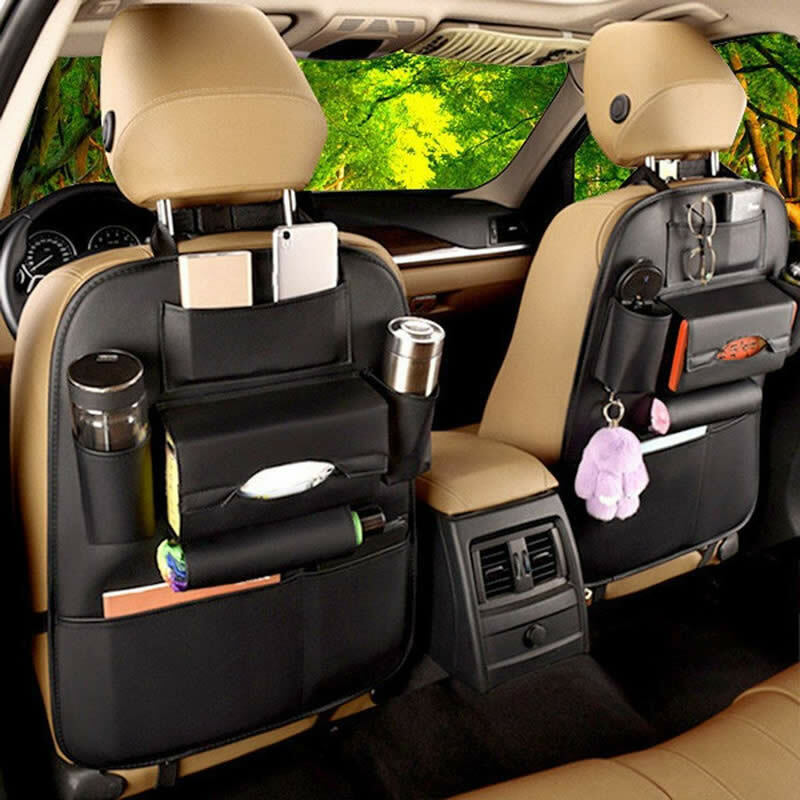 Take the Mess and Clutter out of Your Car with this Well-designed Back Seat Organizer! Our Car back seat organizer has pockets that hold bottles, phones, tablets, tissues, magazines, sunglasses, notebooks and more! An all-in-one everyday solution for any body looking to make daily routine or cross country trips more organized and safe!. At last, a versatile bag with adjustable drawstring straps and convenient slots for anything from books, kids treasures, sippy cups, kids tablet, phone, Disney cars, Android tablet, cans snacks, tablets, activities for the road, and even stuffed toys. Reduce the car TRAVEL stress. CUT the CLUTTER!! Built to fit almost all vehicles, this product is a MUST-HAVE for your car. 100% clear TABLET holder with touch screen capability. "I spend a lot of time in the back of my car since I have added this. I needed something that would protect the back of the seats from children, and something practical to stuff in. The only struggle with getting the bottom attachments on, but it was easy once I got the top. It is very sturdy.."
"Decided to buy a car organizer after I got really tired cleaning up the car on a daily basis. I found this one and what immediately got my attention! I needed two of them but bought just one to see if I like it or not. After using it for several weeks, I can tell I made a good decision. The design and quality is really good, very useful and a great space-saver. The pockets are pretty spacious that can accommodate a ton of different items, and the top pocket holds devices pretty well. So far, no complaints!." This product can easily go for N25,000 Naira however we won't charge you that. Infact, we won't charge you even N20,000. You only need to pay for N25,000 N15,000 N10,000 if you act fast. Please fill the form below with your correct details and our delivery personnel will contact you with your package. PLEASE, MAKE SURE YOUR MONEY IS READY BEFORE PLACING YOUR ORDER! WE DELIVER WITHIN 2 - 3 DAYS.